A GMT watch doesn't only display the local time, but an additional time zone as well via an extra 24-hour hand. This is ideal for making calls home while on business trips. 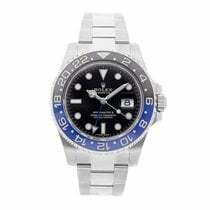 GMT watches are available in a wide range of prices. GMT is an acronym found in the names of many watches. Rolex's GMT-Master II is one of the most famous examples of this type of watch. Its predecessor, the GMT-Master, plays an important role in the vintage watch market. Rolex introduced the first model of this series in 1955. Their original target audience were pilots, as the airline Pan Am had commissioned them to develop a watch for their pilots. The GMT-Master thus became Pan American World Airways's official chronometer. Aside from the standard seconds, minutes, and hour hands, the watches in the GMT-Master series have an additional hour hand that makes one complete rotation every 24 hours. Since the introduction of the GMT-Master II (caliber 3085) in 1983, you can set this extra hand separately via the crown. Therefore, you can easily set it to another time zone. The time in the second time zone is told not via the hour indices on the dial, but rather via a 24-hour bezel. With the combination of the extra hand and special bezel, you can tell the time in another part of the world. How much does a GMT watch cost? The Rolex GMT-Master models are a good choice if you're looking for a sturdy watch that displays a second time zone. The GMT-Masters are probably the most well-known GMT watch for men. A new stainless steel GMT-Master II costs around 7,000 euros. It's powered by the in-house automatic caliber 3186. Timepieces in very good condition cost around 6,000 euros, while gold versions set with diamonds cost significantly more, around 80,000 euros. Collector's pieces on the vintage market can also cost around that much, such as the first GMT-Master with reference number 6542 produced from 1955-1959. Depending on its condition, some of these rarities are sold for over 100,000 euros. A more affordable alternative from Rolex is the Explorer II. There are many watches in very good condition available for around 5,500 euros. The Breitling Navitimer and the GMT-Master have similar backstories: They're both pilot's watches from the 1950s with a circular slide rule. The GMT version costs around 7,000 euros new, while a new Navitimer World costs about 4,500 euros. There are no significant differences in terms of functionality. If you want a see-through case back and a 48-mm case instead of a 46-mm case, you should purchase the GMT-Master. The World has a steel case back engraved with the names of metropoles and their time zones. This useful feature allows you to easily set the time for a second time zone. 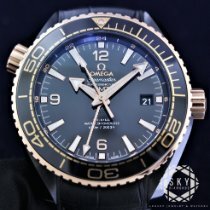 You should be prepared to spend around 5,000 euros for a new Omega Seamaster Planet Ocean. If waterproofness is a deciding factor for you, then this diving watch is perfect. It's waterproof to 600 m (60 bar). The Seamaster Aqua Terra can go to depths of max 150 m (15 bar) and is thus well-suited for swimming, water skiing, and other similar activities. However, it has a more elegant design compared to the Planet Ocean. Another Swiss GMT diving watch, the Master Compressor Diving GMT from Jaeger-LeCoultre (reference number Q187T770), is available for around 6,000 euros. It has a lightweight titanium case and is waterproof to an impressive 1,000 m (100 bar). The Luminor GMT watch from the Italian company Panerai is another one of the most famous GMT diving watches. It costs around 6,500 euros new. A 24-hour scale on the bezel of a GMT watch won't leave you with any doubts about whether it's 4 AM or 4 PM in another time zone. Rolex designed a bicolor bezel for the GMT-Master to make the distinction between night and day even clearer. The most popular version is nicknamed the Pepsi. It features a red and blue bezel, with red representing the daytime hours (between 6 AM and 6 PM) and blue representing the nighttime hours (between 6 PM and 6 AM). The GMT-Master's bezel can be rotated in both directions, unlike that of the Rolex Explorer II. The Explorer II also has a central 24-hour hand and a corresponding scale, but its bezel doesn't rotate. The bezel on the GMT-Master and GMT-Master II has changed over the years. The newest versions are made of Rolex's own ceramic, which they call Cerachrom. Ceramic is advantageous seeing as it's very scratch resistant. Aluminum, which was previously used, is much more prone to scratches. The earliest GMT-Masters had a bezel inlay made of Bakelite, a plastic which was used in the 1950s for phones, radios, and light switches. Today, old GMT-Masters with Bakelite bezels are highly sought-after collector's pieces. Breitling offers two watches with an extra 24-hour hand in their famous Navitimer collection, the Navitimer World and Navitimer GMT. Both have a 24-hour scale on the dial instead of the bezel. The Navitimer GMT has a 48-mm case, which is 2 mm larger than the Navitimer World. It is powered by an in-house caliber (Breitling B04) and has a see-through glass case back. The Navitimer World has a steel case back engraved with the names of important world cities and their time zones. Some manufacturers put two time zones on their diving watches, such as Jaeger-LeCoultre's Master Compressor Diving GMT. The extra hand is located on a 24-hour subdial at nine o'clock. Omega also produces versions of the Seamaster Planet Ocean and the Seamaster Diver 300 M with a central 24-hour hand. The Seamaster Aqua Terra is also available with this complication. GMT stands for Greenwich Mean Time, which was introduced as the international civil time standard in 1884. It does not observe daylight savings time and does not depend on location. GMT was replaced by Coordinated Universal Time (UTC) in 1972. UTC is based on International Atomic Time (TAI). GMT watches are not always clearly distinguished from other similar watch types. There are many similarities between dual time and GMT watches, for example. One good example is the IWC Ingenieur Dual Time; with a central 24-hour hand, it can also be marketed as a GMT watch. World time watches are also closely related to GMT and dual time watches. A world time watch, such as the World Time from Patek Philippe, displays all 24 time zones in the world at once. If you have a dial in front of you covered with the names of different cities, then you likely have a world time watch. In a broader sense, however, watches such as the Breitling Navitimer World can also be considered world time watches. It's worthwhile to mention that the term "GMT watch" isn't entirely accurate, as you can set the watch's second time zone to any time you'd like, not just Greenwich Mean Time.